Buona sera. Tough call today. Do I discuss the effects of entropy on unstable radioactive isotopes, and then move on to point out that the Second Law of Thermodynamics applies to both open and closed systems — or do I show another picture from Farmville? Yeah, let's do the fun stuff. Outside the fence is a grove of olive trees, symbolizing Gethsemane. The ponds and things have nothing to do with symbolism. At the center of the bottom, partially obscured by the greened-out box is a schoolhouse. There's a sign next to that that says something like, "We home school. 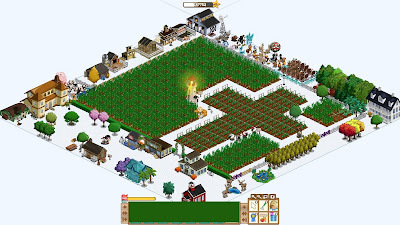 Welcome to Jesus Freak Church of Farmville".